The Federal Transit Authority (FTA) is spending $54.5 million to purchase 60 electric buses and charging stations for public transit systems across the country, costing taxpayers nearly $1 million per bus. The FTA announced the projects last week as part of their Low and No Emission Vehicle Deployment Program (LoNo), which provides funds to replace public buses with electric and hybrid vehicles. Local transit authorities in California, Kentucky, Massachusetts, Ohio, Pennsylvania, and Texas will receive the electric buses. "The main purpose of the LoNo Program is to deploy the cleanest and most energy efficient U.S.-made transit buses that have been largely proven in testing and demonstrations but are not yet widely deployed in transit fleets," the FTA said. "The LoNo Program provides funding for transit agencies for capital acquisitions and leases of zero emission and low-emission transit buses, including acquisition, construction, and leasing of required supporting facilities such as recharging, refueling, and maintenance facilities." The latest round of projects will cost $54,469,249, providing 60 electric and hybrid buses and associated charging stations, at an average cost of roughly $907,820.82 a piece. A diesel bus costs about $300,000. Seven of the 10 projects are providing millions to purchase Proterra battery-electric buses, which cost about $850,000. 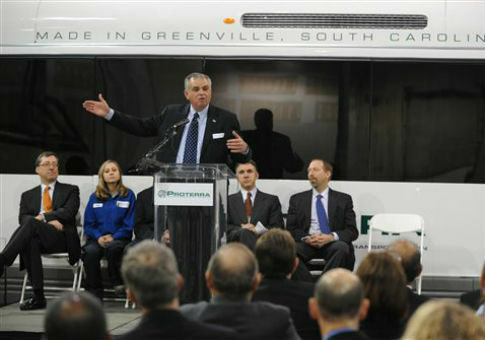 Proterra, a clean bus company based in Greenville, S.C., is led by Ryan Popple, formerly the senior finance director for Tesla. The company spent $230,000 lobbying for transportation issues in 2014, and 4 out of 5 of its lobbyists have previously held government jobs, according to the Center for Responsive Politics. CALSTART, a green transportation nonprofit group, is assisting with three of the projects, worth $24 million. The organization, which has an agreement with the FTA to produce the first of its kind "zero emission 60-foot electric bus," will provide "various consulting services, such as data collection, analysis, surveys, specification alignment, and transit bus acquisition services." "This critical FTA program will help spur the growth of the advanced tech bus industry in the United States, which is a crucial part of the effort to meet our national air quality and climate challenges," said John Boesel, CALSTART's president and CEO. "We are especially pleased to be working with three of the FTA awardees and helping to make zero emission buses competitive with existing diesel technology." CALSTART has received $34,519,664 from the federal government since 2000, including $11,239,305 from the Department of Transportation (DOT) for its National Fuel Cell Bus Program last year. The company also received $300,271 for a "US-China Clean Truck and Bus Technology Forum" in 2011 from the Department of Commerce, and $1,275,000 from the 2009 stimulus law to replace 51 vehicles. Boesel has contributed $25,000 to Democratic candidates since 2001, the same year he was promoted as president and CEO of CALSTART, according to the Federal Election Commission (FEC). Prior to 2001, Boesel had donated a total of $4,000 to Republican candidates. He has donated $5,500 to retiring Sen. Barbara Boxer (D., Calif.), $1,700 to Sen. Dianne Feinstein (D., Calif.), and $2,000 to Sen. Patty Murray (D., Wash.). This entry was posted in Issues and tagged Democratic Donors, Federal Budget, Green Energy. Bookmark the permalink.